Donald Ryder Dickey (1887-1932) was a naturalist, a collector, a hunter, and a wildlife photographer. Born in Iowa, he came to California early with his parents and made it his home. 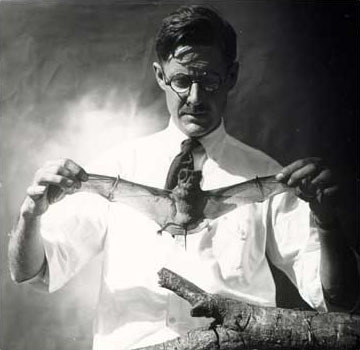 During his relatively short life, he built a substantial bird and mammal collection numbering over 50,000 specimens with an eye toward starting a museum program and center for the study of natural history in Southern California. He was the official photographer on the Smithsonian Institution sponsored Tanager expedition to Laysan Island, Hawaii in 1923. Just before his death he sponsored an extensive collecting trip to El Salvador. The 300 images on this site were selected from the over 4000 still images he took from 1911 to 1929. Below are links to articles about Donald Dickey. One was written about Dickey during his lifetime and one after his death. Millard, Bailey. The Martin Johnson of America: How He "Catches Wild Animals,” The Worlds Work, Vol. 52, September, 1926, p. 567-570. Wild Life of America: Photographs by Donald R. Dickey, The World's Work, Vol. 52, September, 1926, p. [ 558-566]. Harris, Harry. An Appreciation of Donald Ryder Dickey, The Condor, Vol. 36, No.2, March 1934.